Math Landing is a database of mathematics lessons and interactive resources for use in elementary school. The National Library of Virtual Manipulatives has a lot of interactive activities for students learning the use of fractions, addition and subtraction, and the multiplication of fractions. Visual Fractions has eight categories of visualizations, lessons, and games for students to explore and learn the functions of fractions. Thinking Blocks provides interactive templates in which students use brightly colored blocks to model and solve problems. Tutpup is a fun website on which young students can practice their mathematics skills in a friendly online game format. Who Wants Pizza? Is a fun online activity for learning about fractions. Wolfram Alpha is a computational search engine, try it! Aplusmath was developed to help students improve their math skills interactively. Harcourt megamath has interactive math games for students. Mathsframe has many interactive resources, many of which could be used with a Smartboard. Math playground has many interactive math games. Gamequarium has many interactive math games. Math slice has many resources including a worksheet generator. Harcourt Itools provides online manipulatives. 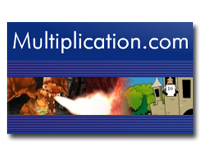 Multiplication.com has many resources and interactive games for practicing multiplication. ICT games starts with a table of contents that you can search for math games that match your curricular goals. It will allow "free" time on the computer to be more focused on current concepts or used for reteaching. XtraMath allows teachers to provide math practice for their students along with back end data for the teacher regarding progress. It's free and easy to set up. Planet Nutshell has a number of short kid-friendly math videos that can be used to supplement lessons. Topics include,greatest common factor, long division, and writing equations among others. Prodigy offers free game-based math practice. It provides a teacher dashboard to keep track of student progress. Cool Math 4 Kids offers a variety of games for students to practice their math skills. There are other resources for both teachers and students as well.